One of the important new antibiotics discovered and developed by pharmaceutical companies in the past few years is Rifampicin and its relative Rifamycin. These potent antibiotics remain key tools in fighting off serious infection. Their story begins with a soil sample taken from a pine forest on the French Riviera in 1957 that was then studied in an Italian laboratory, where unusual antimicrobial properties were observed in a newly discovered bacterium. eventually an unusual molecule produced by the bacterium was identified, isolated, mass produced–and, yes, patented. Rifamycin was credited with conquering drug-resistant tuberculosis in the 1960s. These drugs are marvelous discoveries, important pharmaceutical inventions, and became the subject of multiple patents providing protection and incentives to the developers and improvers of this unique products. Thank goodness these products were discovered and patented decades ago, because today the USPTO would probably reject any patent application out of hand using its newly fabricated and terribly damaging rules that rule out “natural products” as patentable subject matter. This is the result of what appears to be a politically motivated attack on the pharmaceutical industry by the US government, using a Supreme Court decision (Myriad Genetics) as the excuse, but twisting it to go beyond what the Supreme Court said. The political angle is that politicians want to “stick it” to the pharmaceutical industry and appear to be taking steps to lower the cost of drugs by limiting patent scope and other means. But the long-term effect will be reduced innovation and less progress in medication. If a product is actually novel, useful, and non-obvious, the fact that it had origins of some kind somewhere in nature should not be a barrier to patentability. The fact that an unknown bacterium in some French soil existed in nature does not enable the public to understand and produce a powerful, pure antibiotic useful in treating many diseases. Those who discovered, tested, refined, and modified the compounds produced by the bacterium deserved and needed patent production. Without it, there would be lessened incentives to take on the burdens of discovery, testing and drug development. We would be less innovative, not more, without patents for novel materials with some kind of basis in nature. But today, such patents and such innovations are threatened. It’s another example of innovation fatigue driven by political agendas and political machinations. If you think about it, every invention has some roots in nature. The protons, neutrons, and electrons used in every object or affected in every process come from nature. Are we sure that we need a vague and indefinite “natural products” exclusion beyond the more sensible previous criteria for patentability? In Conquering Innovation Fatigue, we emphasize that many innovators are motivated by the desire to make a difference in the world rather than merely obtain personal profit. We also discuss the concept of innovation competitions as a great way to fuel innovation success and access new talent. We also emphasize the importance of collaboration across disciplines and organizational boundaries as the future of innovation success. All these concepts are nicely illustrated by an organization seeking to cure ALS, Lou Gherig’s disease. Prize4Life, Inc. (Prize4Life.org) makes an interesting case study of what can be achieved in the realm of altruistic innovation using collaborative models and innovation competitions. I would like to share with you the case of Avichai Kremer, co-founder and CEO of Prize4Life, Inc. Then a student at Harvard Business School, Kremer discovered in 2004 that he had ALS (amyotrophic lateral sclerosis, or Lou Gehrig’s Disease). Avichai Kremer, co-founder and CEO of Prize4Life, Inc.
A computer-science engineer and ex-captain in the Israeli army, he had planned to graduate, work as a manager in a hi-tech company, and raise a family. Those plans changed drastically when he was told he would have 2-5 years to live, and that the medical establishment could do nothing for him. Kremer’s business perspective sparked his interest in the economics of ALS therapies, and inspired him to use his Harvard training to work for a cure. Little is known about what causes ALS and only a few companies develop ALS drugs, so Kremer and two of his Harvard colleagues queried scientists and industry executives about the gaps that have prevented researchers from finding a cure. Companies said that they needed some basic research tools to reduce the cost of the development, like a biomarker – a better way to track disease progression. So Kremer and his classmates began Prize4Life, Inc., a non-profit organization employing business theories to stimulate research, which announced in 2006 that they would give $1 million to anyone who could come up with such a biomarker. 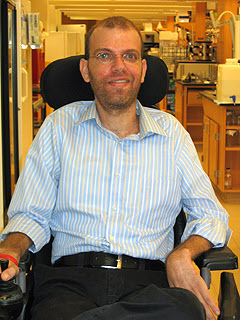 The ALS Biomarker Prize program recently awarded $100,000 in progress prizes, and the organization’s second prize, the Avi Kremer ALS Treatment Prize, hits its one-year anniversary in October 2009. While prizes are the visible core of our results-oriented model, we are also conscious of the need to create a vibrant and supportive arena in which our participating teams can effectively compete. Prize4Life has thus created a series of innovative projects and partnerships, piggybacking on its groundbreaking prize model, to ensure that all competing teams equal opportunity to be successful. As one example of such partnership: in June 2009, Prize4Life and the Alzheimer Research Forum announced the launch of a new ALS-focused internet portal known as the ALS Forum (http://www.researchALS.org). Initial reaction to the new web portal has been swift and positive. The site offers ALS researchers around the world a one-stop access point for cutting edge research news and unique web-based resources. We also have designed and developed a manual to help researchers design their animal trials, and are currently designing and developing a database of genes associated with ALS that we intend to make available to researchers. Prize4Life was founded by a group of Harvard Business School students when one of them, Avi Kremer, was diagnosed with ALS at the age of 29. Prize4Life works to accelerate the discovery of a treatment and a cure for ALS by using powerful incentives to attract new people and ideas, and to leverage existing efforts and expertise in the ALS field. Among other program initiatives, the organization currently administers the ALS Biomarker Prize Challenge, the Avi Kremer ALS Treatment Prize, and the ALS Forum. Meghan also shared with me an example of a successful outreach effort using the competition model. “We actually awarded $50,000 to a dermatologist who had never studied ALS before, and who was intrigued by the prize model, and who submitted a winning entry, which is a testament to the potential of the prize model itself.” For the complete press release with much additional information, see the press release, “Prize4Life Awards Prizes for ALS Biomarker Challenge to InnoCentive Solvers: Extends $1Million Challenge Seeking ALS Biomarker” (PDF). Non-profits join forces to provide researchers with new preclinical resources” (PDF). This describes a partnership with The Jackson Laboratory (JAX®), the world’s leading provider of mouse models, to provide preclinical resources for ALS research. Together, Prize4Life and JAX® have prepared a comprehensive training manual to enable researchers to more effectively use the SOD1 mouse model in the fight against ALS. If you would like to help, Meghan told me that there are many opportunities. “We always need donations and fundraisers (this is the link), but we also have folks who host events for us, who blog on our behalf (on their blogs or on ours), who reach out to scientists who may want to compete for our prizes, to follow us on Facebook and Twitter, to link to us on their sites, the list goes on! We have an exciting event coming up here in Boston, for those who are local–Boston’s pro lacrosse team will be featuring us at ‘Heroes Awareness Night’ at the Boston TD Garden on February 6, and donating a percentage of the proceeds to our efforts. If anyone is on the east coast and wants to attend, they should click here:http://bit.ly/512shV. Anyone interested can contact me directly, mkallman at prize4life dot org. A great example of collaborative innovation in action, with bonus points for using innovation competitions and having altruistic goals. ALS is a terrible disease and needs more attention in the quest for cure. One of the hottest trends for modern innovation is customization of products and services to meet the unique needs of individuals. Classic examples of business model innovation based on customization include Dell computer, who developed a suite of patented supply chain advances to assist in rapidly delivering customized computers at low cost, or Netflix, whose supply chain and Internet-based services allow users to select from vast numbers of movies that could never be housed in a local brick and mortar store. Now IT-related businesses including eBay and hundreds of others are increasingly taking advantage of Internet tools, database systems, cookies and other ways of tracking customer preferences and patterns to provide customized offerings to appeal to the unique needs and wants of individuals. The next frontier for innovation based on customization will be health care. Some think this is already happening now that health records can be electronic and advanced diagnostic tools and databases can be applied to meet patient needs, but in reality, much of health care is still based on old models of “one or two sizes fit all.” What is the right medication for a patient? In what dose? Body weight, age, and gender may be considered in writing a prescription, but there are many other factors that need to be considered, including genetics. Understanding the relationship between drugs and individual genetics represents an important frontier for innovation in medicine. Today I’d like to highlight one important example of successful research in this field. Recently in Singapore, while speaking at an Innovation and Enterprise Week, I met keynote speaker Dr. Michael Hayden of the University of British Columbia’s Center for Molecular Medicine and Therapeutics. (Not the same Michael Hayden who was a director of the CIA.) Dr. Hayden was recently named Canada’s Researcher of the Year. In his speech, Dr. Hayden spoke of his quest to understand the mysteries of disease and to reveal their genetic roots to thereby develop better approaches to treatment for patients. One exciting breakthrough that he mentioned, arising from collaboration with others at UBC and beyond, is the discovery that the terrible side effect of deafness that strikes many cancer patients on chemotherapy can be predicted with DNA testing. The popular and highly effective drug, cisplatin, is the problem. By understanding the relationship to genetics, high-risk patients can be identified and alternate medications can be prescribed. Finding genetic links to adverse drug reactions is a major step forward toward treatments that really match the unique nature of each patient. Cisplatin is a widely used and effective chemotherapeutic agent, although its use is restricted by the high incidence of irreversible ototoxicity associated with it1. In children, cisplatin ototoxicity is a serious and pervasive problem, affecting more than 60% of those receiving cisplatin2–5 and compromising language and cognitive development. Candidate gene studies have previously reported associations of cisplatin ototoxicity with genetic variants in the genes encoding glutathione S-transferases and megalin6–8. We report association analyses for 220 drug-metabolism genes in genetic susceptibility to cisplatin-induced hearing loss in children. We genotyped 1,949 SNPs in these candidate genes in an initial cohort of 54 children treated in pediatric oncology units, with replication in a second cohort of 112 children recruited through a national surveillance network for adverse drug reactions in Canada. We identified genetic variants in TPMT (rs12201199, P value = 0.00022, OR = 17.0, 95% CI 2.3–125.9) and COMT (rs9332377, P value = 0.00018, OR = 5.5, 95% CI 1.9–15.9) associated with cisplatin-induced hearing loss in children. Watch for genotyping of patients coupled with extensive research on genetics and drug performance to become a pillar for health care innovation in the future. Customization of care at many other levels can be expected as well, as long as incentives for innovation in health care remain healthy. Congratulations to Drs. Carleton and Hayden and their partners for outstanding work that will drive further innovation in how patients are treated.